The last two episodes have done it - I've jumped completely onto the Seung-hyun ship. Unfortunately, it's clear that the drama is sticking to Ae Ra - Jeong Woo, but I'm going to soak up Seung-hyun's presence while it's here. As a character, he's just such a better fit for Ae Ra. 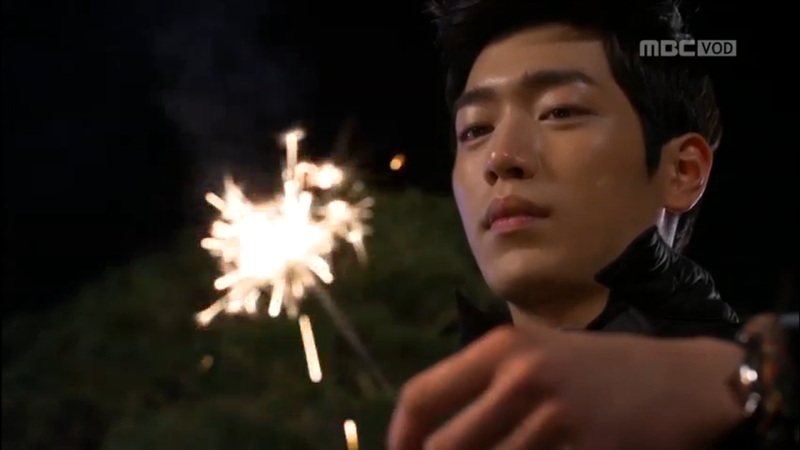 He's self-confident and already understands her strengths and weaknesses in a way Jeong Woo still struggles to do. It's seriously regretful that she's trapped into the single-love-her-whole-life fallacy. Jeong Woo isn't bad per se, and up until episode 9 I was still solidly supporting him. But I didn't take well to 1) his passive aggressive attempts to get her to not meet Seung-hyun, 2) the self-debilitating dorkiness and self-doubt that has emerged when Ae Ra is around, and 3) his evil family. The makgeolli grocery trip was right about the point when I realized I'd switched ships. I was really disappointed to watch how self-centered Jeong Woo became in trying to keep her away from Seung-hyun's confession (despite being a supposed friend to the latter). I was also frustrated with Ae Ra's complete lack of commitment to the promise she made to Seung-hyun - lady, it's clear that your ex has no good reason to keep you sitting around, so don't freaking start reneging on every promise you've made for his sake! Flighty people earn no respect from me, and what makes me more upset is that Ae Ra did this not once, but twice to poor Seung-hyun, both because of clearly stupid excuses from Jeong Woo. The emergence of dorky Jeong Woo also has me debated. I think this is supposed to be his true form, but I don't find it particularly endearing or even likable. Ae Ra seems to bring out the worst in him, making him weak and finnicky and not even committed to his company. No wonder he failed to succeed in their years together. It might also be my own preferences speaking, but I don't find dorky Jeong Woo at all attractive. He's slightly funny, but mostly pathetic, insecure, and desperate. I didn't enjoy watching their interactions during both the makgeolli trip and the late-night birthday office work (and seriously, what a douchebag for doing that to her - were we supposed to feel touched by the instant soup and cheap cake?) There was none of the earlier spark that had me rooting for them, and instead their current relationship seemed over-dependent on their past relationship. In other words, I'm not seeing romantic chemistry so much as two people who are accustomed to one another and returning to old, staid habits. The final kicker is his family. Ae Ra's mom is totally right here, rejoining that family would be absolute hell, and I doubt the drama could ever convince me otherwise. Unlike Jeong Woo, Seung-hyun clearly just gets her. We saw that episodes earlier, when he stated how it wasn't like her to lack confidence when speaking about her divorce. He's such a better fit for her character, and the actors have chemistry that's growing inverse to her chemistry with Jeong Woo. It might just be lazy writing, but I think even Ae Ra has some awareness for her attraction to Seung-hyun, considering how she's still happy to meet with him even after the rejected confession. They feel like real people when they're together, unlike the caricatures that emerge with Jeong Woo. Unfortunately, I've resigned myself to seeing more of Seung-hyun's disappointed face in the episodes to come. They've had fairly limited screentime, and there's the bigger issue of Jeong Woo being completely incompatible with Yeo Jin. I'm sure the writers wouldn't possibly let one of the main pair end up alone, and Yeo Jin is turning out to be quite the unlikable character. Pity only gets you so far, and Yeo Jin has reached far beyond that. I'm hoping Jeong Woo will be able to reclaim my favor in the coming episodes. Tone down on the excesses and give me more actual character moments, and I might be convinced. Otherwise, this is going to be a very disappointing road to the finish.